Give the new connection a name here. Provide the new connection with a description. The web service URLs are obtained from your hyparchive server installation. Normally these are created from the host name of the hyparchive server, the port and the name of the web service. Access to the dg hyparchive web service normally ensues via SSL. Each URL must therefore begin with "https://". In addition, the SSL certificate of the hyparchive server needs to be imported into the Intrexx License Manager. There is also the option to activate the services without a certificate, this is done by deactivating the SSL certificate check. The authentication methods, which the portal user will use to access hyparchive, are defined in this area. Enter the corresponding username and password. The Intrexx Portal Server must be run with the Microsoft Internet Information Server and be a member of a Windows domain. The Intrexx Portal Server must be configured for Integrated Windows Authentication and the user must be imported from the active directory. 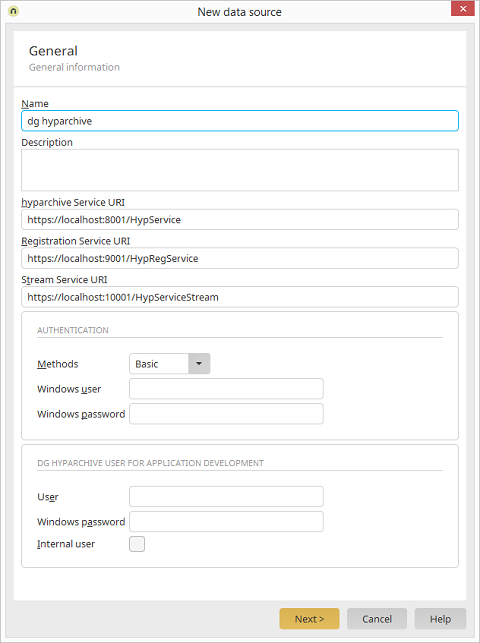 A Service Principal Name must be defined for the hyparchive dg connect WCF Server. Single Sign-On Authentication must be active for the dg connect WCF Server. Further information can be found in the dg connect WCF documentation. There must be a corresponding Windows account user for every Intrexx user, who should access hyparchive. The Integrated Windows Authentication should be activated for the client browser. If the conditions named above are fulfilled, then the Single Sign-On can be activated. For this, a hyparchive Username/Password will be needed to access the metadata. Whereby "<hyparchive DNS Name>" should be replaced with the fully qualified DNS host name of the hyparchive web service Server. The host name must be identical to the host name that was entered for the URL. After the configuration is saved, the integrated authentication will be automatically activated. When correctly configured, Intrexx portal users will automatically be logged in when accessing hyparchive files. Should problems occur while setting up Single Sign-On, you can find additional instructions to help analyze problems with the Kerberos authentication here.